Commercial Club, Albuquerque, N. M.
Albuquerque, is the largest city in New Mexico. It has the largest wool scouring mills, the largest lumber mills, and the largest tie treating plant in the world. 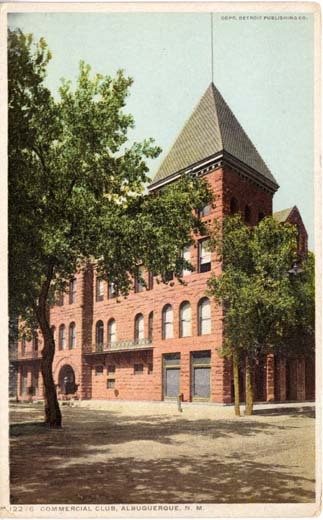 It is one of the largest wool centers in the United States. It has schools of high rating from kindergartens to university, churches, public libraries, daily papers, banks, factories, and public works. The commercial club is the dynamo which has generated this activity. 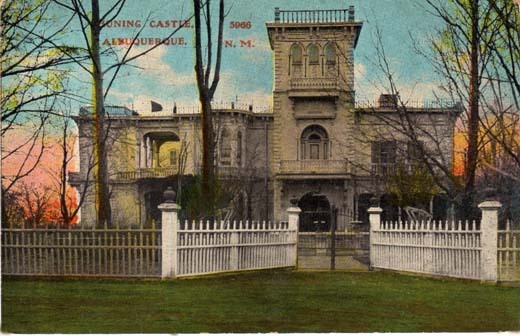 The ABC Library does not claim ownership of any copyrights to images on this site.These images are intended for personal or research use only. Any other use, including but not limited to commercial or scholarly publication in any medium or format, public exhibition, or use online or in a web site, may be subject to additional restrictions including but not limited to the copyrights held by parties other than the ABC Library. USERS ARE SOLELY RESPONSIBLE for determining the existence of such rights and for obtaining any permission and/or paying associated fees necessary for the proposed use. 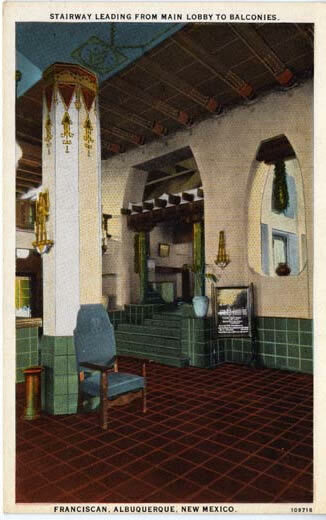 Franciscan, Albuquerque, New Mexico, formally opened its doors to the public December 15, 1923. 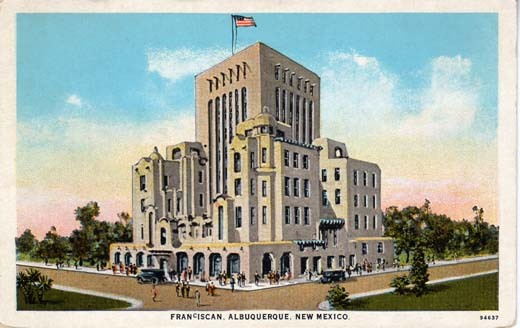 Albuquerque and the Franciscan are the center of New Mexico of which Arthur Brisbane writes: “until you have seen New Mexico’s sky and mountains and deep red earth you do not know America. Until you have breathed the air of this heavenly land you do not know the best place for men and their children on this whole earth.” Franciscan is a hotel unique in the appropriate beauty of its architecture. The courtesy, thoughtfulness and helpfulness in catering to the comforts of guests make this hotel more homelike than hotel-like. 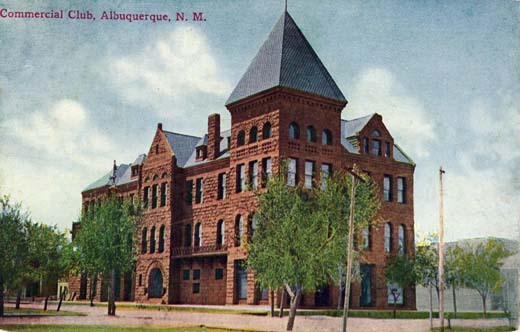 Bernalillo County Court House in Old Town of Albuquerque, New Mexico. One mile from New Town. Connected by Electric line. 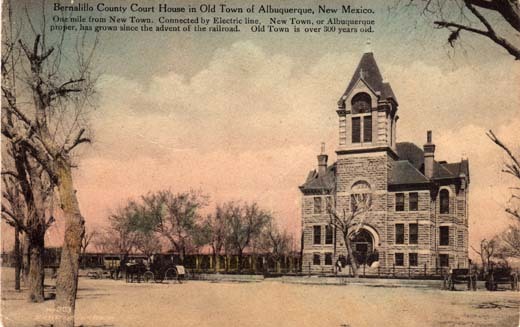 New Town, or Albuquerque proper, has grown since the advent of the railroad. Old Town is over 300 years old. 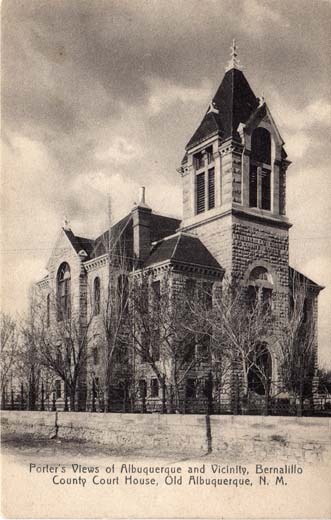 Porter’s Views of Albuquerque and Vicinity, Bernalillo County Court House, Old Albuquerque, N. M.
Huning Castle, Albuquerque, N. M.